I think I have lost a pound or two. The day after I hurt my leg I went into the dining room at The Rosemount in Windermere for breakfast. I said good morning to a visiting Japanese family on the far table. They prodded the full English looking slightly confused. I had my phone in one hand and lifted the orange juice with the other. I hobbled a few steps over to my table. I caught them by spreading my knees quickly. I squatted looking at their confused faces thankful I was already showered and wearing underpants. The squatting motion hurt my leg and for what felt like ages I stood unsure of what to do. I couldn’t reach the table to put the juice or phone down. If I stood up straight, my trousers would probably fall from my knees to the floor and this squatting position hurt my leg terribly. They nodded back politely possibly thinking that this was a traditional local greeting. With my face contorted in agony, the Japanese guests could have mistaken this performance for a Cumbrian version of the famous New Zealand Haka. Would they reciprocate? Thankfully they remained seated and clothed and soon returned to prodding their breakfast quizzically. I turned away and waddled over to my table like a duck, waving my bum at them. In the end they decided not to eat their breakfast. I smiled, remembering that anecdote, as we pushed Dolly from Dalton back home to Barrow. Janice and Blez had filled us with breakfast and we were well rested from sleeping in a warm comfortable bed. We spent a lovely morning with them watching Blez open his birthday presents, sipping coffee and relaxing. It was good to be with Janice on the last morning of our project. Janice is the third member of our team and every round of applause we receive we share with her. Before leaving the weather forecast was awful. My son Alfie called me concerned that the high winds and driving rain would spoil our last show and suggesting that we might ring the lady from the park and ask if we could perform in her café. My wife later told me that he had spent part of the morning nibbling a biscuit into the shape of a moustache and imitating Lord Gregg’s Dutch postman from the show. Maybe he will be a Vagabond showman one day himself. I hope so. I smiled more and more as I pushed closer home to them. The rain and wind stayed off us. We could see the dark clouds in the distance but thankfully we were unable to catch them up as we pushed quickly towards home along the still wet pavements. Our very first performance was on Piel. For those who don’t know,this is a beautiful and historic island just off the coast of Barrow. The Island has a King, and the King of Piel is the landlord of the pub. The current King of Piel is a bloke called Steve. As we were leaving the island after our first performance I asked him if he had an official troubadour. A troubadour was, as Janice discovered, a member of the royal court who would collect and tell stories. Somebody who would be dispatched to gather local news and report back. The Island was currently void of any troubadour and so kindly and without ceremony the King made us his. I am truly honoured, I have never had any letters after my name and from now on and until the King tells me any different I will announce myself as Gacko T.O.P (Troubadour Of Piel) A great honour bestowed by the only monarch I recognise. I marched proudly into town. We stopped to talk to a very tall man with a very tiny dog. Sadly the dogs legs were rather small and as we were keen to get to our performance on time we left them quickly behind. 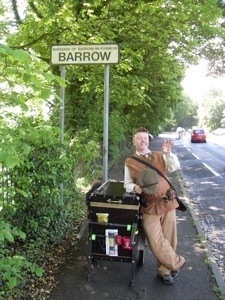 It’s a shame because we then had nobody to ask if they would take a picture of us arriving back at the welcome to Barrow sign. We stopped for half a Guinness in the Strawberry, toasted each other and downed it in one go. We never drink alcohol before a show. However the day before we had pushed Dolly up the front door of Clarence House. Clarence House is very fine and highly regarded establishment just inside Dalton. I was minging. My cloths were dirty and we hadn’t showered for two days. I felt generally tacky but Lord Gregg informed me that I smelled OK.
OK is good enough for me. We parked Dolly alongside some rather fancy off road vehicles and a couple of BMWs. Myself: “Puppet Show mate. She’s called Dolly”. We sat feasting on fine food, we even allowed ourselves a small glass of wine and like i said we never drink before a show. Later we were joined by a group of investment managers and property agents. They were lovely and we had a good old natter. I did notice that apart from the staff us Vagabonds were the only people wearing ties. I suppose it was a Saturday. We had decided to push Dolly into Barrow park through the main gates. This decision would result in a steep hill up to the cenotaph, but we are good at pushing now. Anyway we would have help. What looked like a family came into view, my boy Alfie running along the pavement with his arms outstretched. He leapt up and I held him tight as we walked. I kissed my wife and ah Mam. Alec (P2) and Dave Hill (P5) made up the family our welcome party, our entourage and it was good to see them! Good friends! Thank you. We pushed and hauled Dolly to the top then lowered her down to the bandstand. The Evening Mail were again waiting. Our local paper, the Evening Mail, has supported us all along the way. Almost every gig we have delivered has been covered and advertised by them. Thank you to all the staff! and also to Ospray who have supported and managed our publicity, raising our profile and bringing our humble little show to the attention of national newspapers, television and radio. Thank You! We set up, promptly at 1.55 our audience started to arrive and the Barrow Park keepers filled half the bandstand with chairs. The weather was sunny and hot, so hot in fact that steam rose from the recently soaked pathways. Blez was quick to use his new birthday camera and capture the spectacle. Blez (P1) has helped massively supporting our technology and has also captured some beautiful images of our act along the way. Thank you Blez! Our largest audience gathered and despite there being a monster truck show in town and it being the last day of the football season we pulled in 150 people, a massive amount for our little show. But we are home now and so many faces are familiar. Therese was there fresh from a Boomdang gig earlier in the day. Thank you T! Some old friends, our families, but new faces too. Gaff joined us again, Jackie from the Windermere Boat Company had brought her family, some people who had seen our show once already and wanted to see it again. The Lakes Alive team were out in force featuring Alison (P4), Damo (P5) was there setting up his camera, thank you both! Friends, family and local folk all mixing together on our local bandstand. Our last show went very well indeed. Rousing in fact. After our final bow we packed down, drank champagne and our audience drifted away. We shoved Dolly back to my house that overlooks Barrow Park and surrounded by family and friends drank some more. We counted our final hat, £111.01, our best take so far. Soon after Janice and Blez left to celebrate his birthday, taking Lord Gregg with them. Throughout the evening my friends and family went home and so to bed, my own bed, next to my beautiful wife. Dolly is resting in her shed. So our journey is over. What was its value? Basic and honest head counting, we had over 1220 people who sat and watched our various shows. They paid us a total of £873.05 that’s £436.525 each – slightly less after we shared some of our take with others. That adds up to roughly £145 per week. Counting up my share last night I arrived home with £130 after the costs of living on the road – that’s £43.00 a week and I shall proudly add it to my accounts for taxation. We have proved that, should you choose it, a vagabond life is certainly possible. We performed to many people with impromptu roadside performances, far too many to number. I have absolutely no way of gauging the amount of people who asked us “what’s in the box?” and how many times we told them our story, but conservatively I would say hundreds. Thousands more tooted and waved as we passed along the roadsides of South Cumbria. Thank you! It really helped us along. As I’m thanking people, I would like to offer my sincere thanks to Jeremy Shine, Julie Tate and all at Lakes Alive who funded and supported our project. No other organisation would be interested in such ridiculous idea, something that travels to remote rural locations and only expects tiny audiences. Far too many people are interested in footfall and feedback rather than interesting ideas. To Lakes Alive and all of their funding bodies a huge Thank You! Thank you to my wife, George, and my son, Alfie, for letting me out to play, to Luke and Sarah our makers and to Dolly, our peripatetic perambulator of performance. And of course himself, Lord Gregg, my companion, partner and friend. Thank You! I have always enjoyed the books of Walter Wilkinson. I have for many years dreamed of this adventure. This project has been the top of my list of things to do before I die for a long time. Uncle Tacko bought me my first Walter Wilkinson book. He used to read it to me in the tent we shared after our Poppets Puppets gigs. Had diaries been different he would have Vagabonded with us. I dedicate my share of this journey to you. !Long Live The King Of Piel Island!